This is the entrance to the Café de Paris, a famous London nightclub on Coventry Street near Leicester Square, which first opened to partygoers way back in 1924 and is still going strong today. Shortly after it opened, the Café De Paris was the venue for the UK’s first performance of the famously hip and energetic, Charleston dance. This spontaneous debut was carried out by the American model and showgirl, Louise Brooks- a bold act which pulled London firmly into the ‘Roaring 20s’. 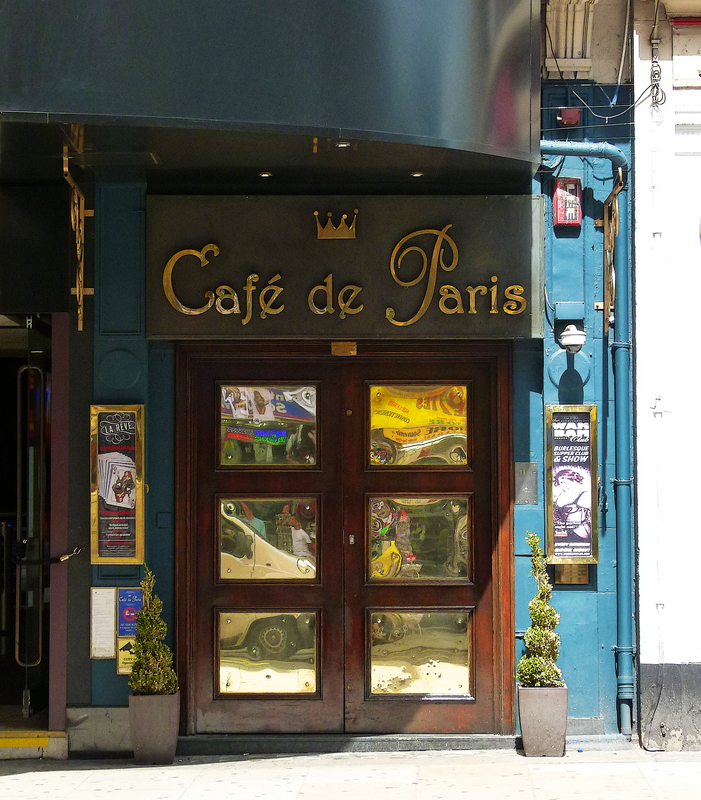 A decade later saw the outbreak of WWII and the subsequent Blitz on London- during which time the Café De Paris was considered to be one of the safest places in the West End, due to the fact that the bulk of the club was located several floors underground. For those who had the money and style to gain entry, the assumed safety of the Café De Paris was clearly far more attractive than spending the night sleeping on a stuffy, crowded tube platform or huddled in a dank Anderson Shelter at the bottom of the garden. During the Blitz, the biggest attraction at the Café De Paris was the nightly entertainment provided by Kenrick Reginald Huymans Johnson; more commonly known as Ken ‘Snakehips’ Johnson, leader of his specially put together, ‘West Indian Orchestra’ who were the club’s resident band. Ken was born in British Guyana, South America in 1914. During the 1920s, he rose to become an acclaimed dancer, coached by Buddy Bradley who had also taught Fred Astaire. Ken’s smooth moves quickly earned him his famous ‘Snakehips’ nickname, paving the way for appearances in a number of American cabaret acts, as well as leading to Hollywood and a role in the 1934 film, Oh Daddy. Ken showing off his snake-like hips! During his time in America, Ken visited New York’s Harlem where he got to witness jazz greats such as Cab Calloway practicing their craft. By 1940, Ken and his team of musicians were in London and were already so acclaimed that the Café De Paris snapped them on a permanent basis. It wasn’t just the rich and famous who got to hear the West Indian Orchestra’s exciting music- Snakehips and his talented line-up were regulars on the BBC’s Wartime Service, giving Brits a welcome and uplifting diversion from the conflict and misery which was consuming the world. On the evening of Saturday 9th March 1941 Ken and his gang took to the stage as per usual. Shortly into their performance, the air-raid sirens cranked into action, sending their eerie banshee howl wailing across the capital. It was during a rendition of “Oh Johnny” that the unthinkable happened. A bomb hurtled down from the sky and somehow managed to pinpoint an airshaft, sending the sinister device tumbling down into the very heart of the Café De Paris where, in a blue flash, it exploded on the dance floor. 34 people- including Snakehips Johnson- were killed instantly and a further 80 were seriously injured. A number of those killed perished as the powerful blast sucked the air out of their lungs; a deadly phenomena which caused the victim to display no outward signs of injury, but instead left them statue-like; frozen in the pose they’d been in on the moment of impact. One of the first to rush to the scene was a police officer called Ballard Berkeley… who would later go onto become an actor, playing the character of Major Gowen in the much loved sitcom, Fawlty Towers. Watching him act in such a well-known comic role, it is difficult to imagine the horrors which Ballard witnessed in the aftermath of that dreadful bombing. Ken Johnson, whose once beautifully agile body was severely ravaged in the blast, was cremated at Golders Green Crematorium. He was just 26 years old. The loss of the great Snakehips and his band was felt deeply. When The Times reported on the disaster, they deliberately avoided mentioning the band by name for fear of damaging public morale. The devastated Café De Paris remained closed until after the war, finally re-opening in 1948. Below is a rare recording (made approximately two months before the Café Des Paris disaster) of Ken and his West Indian Orchestra preforming ‘I’m in Love for the Last Time’, the distinctive sound which, for an all but too brief period, lifted spirits during one of Britain’s most devastating periods. My late father in law was a fire watcher opposite the Cafe de Paris and saw it go up .After he put out a couple of incendiaries that had landed on the roof and the raid had passed he went over and saw the full horror of bodies every where .He was a fire watcher as he worked in the area and had rheumatic fever as a kid sonot allowed to fight ,although actually quite fit .He said he just sat there drinking tea(of course) waiting for a raid and then the bombs and incendiaries.He said f he and hundreds of others hadnt done it London would have burnt to the ground in days .Later the V2 that killed three members of my family nearly killed him too as he was cycling past my Grandfathers flat and was propelled off at a huge speed and fell off his bike .My own father was approaching the flat shortly afterwards and the first he knew was two men carrying his familys carpet away .They were looters of course.When he arrived at the site he was confronted by a pile of body parts of his dad,two sister and a lodger all piled up. Thank you for sharing… this is a very profound insight. the night it was bombed. Quite a story, that. My mother in law was there too. She said there was a photo of her taken,publishedi. a newspaper, not sure which one, 6 you g ladies outside working in Stag and Russell next door. They swept the streets outside from the bombing. We would love to see thT photograph. She has fond memories working there and often describes the horror of the 8 March bombing. Gosh, that’s quite a story Hatty. Thanks for sharing. in this feed. My dad was there that night, maybe the only American (pre-Pearl Harbor). Your great pics allow me to pursue a small model I will build of that episode.